Britain's first black skating champion, Vanessa James, is poised to switch her allegiance and represent France. The 2005 British Champion wants to link-up with French skater Yannick Bonheur after the relationship with her current partner did not work out. 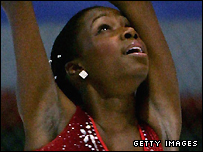 Keith Horton, general secretary for the National Ice Skating Association said: "We'll be sorry to lose her. "Vanessa has only skated with us for a few years, but the relationship with her partner wasn't working." Horton added: "She was looking for another partner and we tried to assist her by searching for one here in Britain. "However our understanding is she has linked-up with the skater in France, but as yet we haven't heard anything from the French federation. "We fully understand that she is ambitious and we wish her well." The Canadian-born USA resident holds a British passport through her Bermudan father and first skated with Bonheur in a gala last year. The French skater is a three-time national champion and was placed 14th at the 2006 Winter Olympics with his former partner Marylin Pla.